I had soooooo much fun sitting around a big table with several women I have come to know through the blog world. It was nice to listen to 3-4 conversations going on at the same time, as only women can do. We laughed, learned, and looked at new ideas. During one of the conversations, I asked how many had hunters covering their ground this past weekend, and got some blank stares. Doesn't all of Indiana know when opening day for pheasant season starts? Obviously, I have been around these beautiful birds for a very long time.... a VERY long time! My dad brought home this bird many many years ago, and Saturday he called to tell me he and one of his fraternity brothers, Theta Chi at Ball State, Class of '61, shot two birds this weekend. Woo! Dad is now 71, and I am so glad he went out. He just lost his childhood hunting buddy last month, and I was a bit worried he wouldn't go. It's such a part of his life, and just as important is the preservation of the land for these birds to have nesting grounds. Pheasants Forever is a big group in these parts. They work with the conservation departments to create bird ground habitats for pheasant and quail to have a safe, natural place to raise their young. Back in the day, like the late 70's, we had three very harsh winters complete with blizzards and snow drifts as high as the house's roof! These winters were very hard on the wild bird and rabbit population. Many of them died, so many that we didn't see quail around for many years. Just this year I have heard the "Bob Bob White" call of the quail when I walked in the morning. The pheasants recovered more quickly, and the rabbits, well.... we know what they do well besides eat the veggies in our gardens. Want to hear a cool story/ Wish I had a picture for this one. 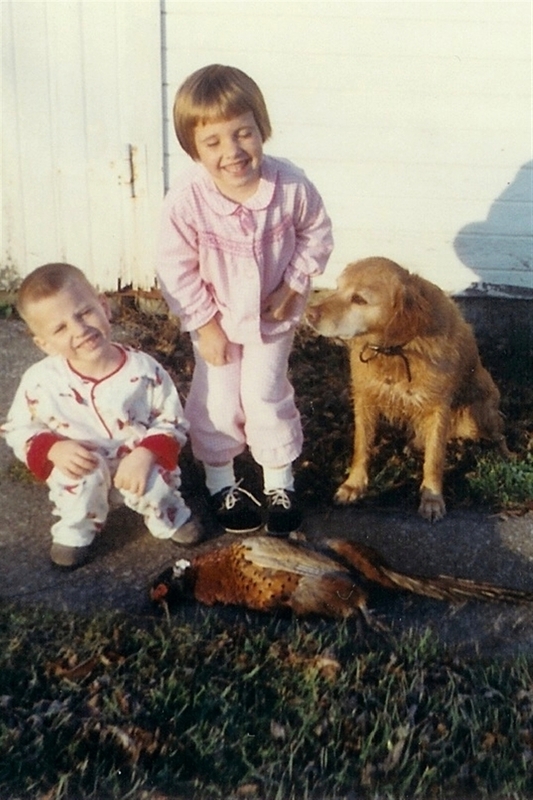 Dad took my brother and I out hunting once, only this time we were just "scouting." We tracked a lot of birds in the snow, but then all of a sudden Dad told us to stand still. He walked a few steps, stopped, then walked a few more. He was headed in the direction of a clump of grass. He bent down over the clump, and scooped up a live quail! SERIOUSLY! I will always remember that day! I was soooo impressed, as I always am with my dad, but this day stands out as one of the best! So whether you are out with a gun, a camera, or you own eyes, it important to appreciate nature and the creatures around us. There are many bright orange hats floating around our fields these days, but don't think these men and women do not have a great love for the land and the birds/animals they hunt. My dad hunted pheasants when we lived in North Dakota. Whew...such a long time ago! Thanks for bringing back some wonderful memories for me. Thanks for the reminder that hunters are also animal and nature lovers. What fun to get together with your bloggy friends... how fun to share those stories. I had no clue about pheasant season! Huh. And yes, we're in Elkhart Co. Indiana. Probably not too far?? ?